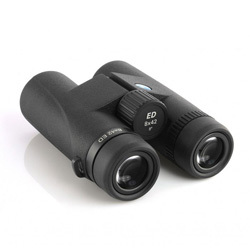 Introduced in 2014, the ED-FF binoculars from Viking retail at a pound shy of £400 and are therefore aimed at the enthusiast rather than the beginner. But with their field flattening lenses (hence the FF), perhaps they offer even more than what you'd expect for the price? We get hands on with the 8 & 10x42 models in this review to see how they fare. The field flattening lenses are really what set these apart from the (similarly priced) competition. With an impressive 8° field of view on the 8x42s and a respectable 6.4° on the 10s, having a sharp image with almost no distortion at the edges can prove useful in certain conditions. Let's be completely honest, most of your time spent birdwatching through binoculars involves looking at the bird in question in the centre of your vision, so all the other elements which are still beautifully crisp at the edge don't really matter. There are moments, however, when this could come in handy - scanning a huge flock of waders on the Norfolk coast or a skein of Geese as they return for the winter becomes more pleasing to the eye when everything is in focus. In tests I found the minimum focus on both the 8 and the 10s was around 1.5m, significantly closer than the 2.5m which Viking quote. As seems to be the norm in this price category, the body is made from magnesium alloy rather than polycarbonate which is common in cheaper models. Both models weigh 850g and are therefore some of the heaviest 42s on the market. Having used them for a considerable amount of time, I never felt as if they were a burden but it is certainly a factor to consider. The lens elements are protected from internal condensation by being nitrogen purged and the 'Viking Oilphobic' lens coatings are designed to counter build up of water, dirt and grease on the outside. The dioptre is placed like most on the right ocular, it doesn't lock but offers ample resistance from accidental knocks but still turns smoothly for adjustment. The twist style eye-cups give 22mm and 18.5mm eye relief on the 8x42 and 10x42 models respectively and stop firmly either half way or at full relief. The textured rubber armouring holds very well, only a light grip is required to keep them well placed within your hands. The thumb recesses on the under side of the oculars allow for a comfortable hold, either with one or two hands. My personal preference is for an open hinge body which of course these aren't, but that's very much a matter of taste. 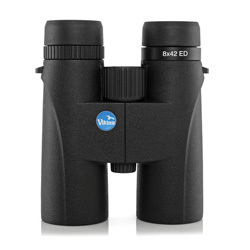 These binoculars are still pleasant to use, very balanced when up to your eyes (not front heavy) and the smooth focus wheel takes about 1.5 turns from close focus to infinity. Packed in the box you'll find your binoculars enclosed in a microfibre bag (which doubles up as a cleaning cloth) within a lightly padded fabric case, which itself has a plastic buckle to keep it shut and a wide fabric strap. I even found another basic cleaning cloth within the case, perhaps the microfibre bag isn't to everyone's taste. The lanyard supplied is a well padded neoprene one with quick release clips. Viking offer a 10 year warranty on the ED-FFs, substantial enough for most but perhaps not as generous as others. Choosing binoculars is very subjective; there are those who only need a £50 pair and there are those who don't batter an eyelid at an £1800 Swarovski or Zeiss. It's very difficult for me to say the ED-FFs are 'worth' £400 because it depends just how much you're going to use them, but as far as value for money goes, they are fantastic. They are made in China and are perhaps a tad on the heavy side, but are without a shadow of doubt very impressive optically and more than hold their own against the competition. The level of accessories is impressive too so you're not left wanting.